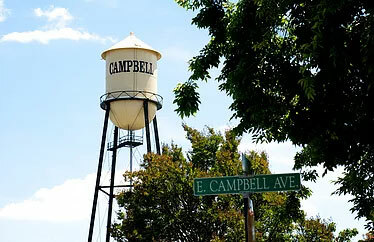 The city of Campbell, formerly a small farming town, has grown into a bustling suburban community. Originally the site of dozens of fruit orchards, it’s most popular fruit was the prune. Consequently, the city’s largest shopping center is named “The Pruneyard” paying homage to its past. Downtown Campbell features tree-lined streets with superb restaurants, locally owned cafes, art galleries and trendy boutiques. The classic architecture gives patrons insight into the city’s historic past with many building still standing in their original early 20th century form. On Saturday and Sunday mornings year-round, the streets are filled with residents and visitors alike for the weekly Campbell Farmers’ Market featuring arts and crafts, locally grown produce and gourmet food. The downtown area also hosts numerous seasonal events such as summer concert series and Oktoberfest. Campbell’s central location, great school districts, and low crime rate make it a very attractive place to call home for Silicon Valley residents.